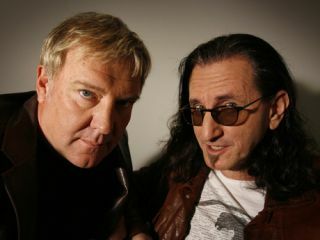 Rush were shut out of a Rock And Roll Hall Of Fame nomination yet again yesterday, but the venerable Canadian power trio of Alex Lifeson, Geddy Lee and Neil Peart will be honored at the 2010 Billboard Touring Awards when they receive the Legend Of Live award on 4 November in New York City. The award, which, according to Billboard, "honors groups or individuals who have made significant and lasting contributions to live music and the touring business, and acknowledges the recipients' commitment to the art of performing live and reaching fans through the concert experience," has previously been bestowed upon The Rolling Stones, Ozzy Osbourne,Tthe Allman Brothers Band and Sir Elton John. "Rush is uniquely deserving of this award as they have a remarkable body of live work that altered the course of rock music and raised the bar as to what can be done onstage, and have a continued commitment to playing live," said Ray Waddell, Billboard's Executive Director of Content and Programming for Touring and Live Entertainment, in a statement. "From the early days in the bars and clubs of Toronto to the stadiums, amphitheaters and arenas around the world, Rush have epitomized professionalism and the spirit of live rock 'n roll, and they boast some of the most passionate and loyal fans in rock." We couldn't have said it better ourselves. Also to be honored will be Jack Johnson, who will be named the 2010 Humanitarian Award honoree. The Humanitarian Award recognizes the philanthropic efforts of a touring professional. Johnson's acknowledgment as the 2009 honoree reflects his involvement in a wide range of environmentally conscious and other philanthropic efforts.